Now that I've got a mechanism for measuring motor current, it's time to try and quantify the effects of motor magnetic field on magnetometers. Data Bus was cursed by Compass heading deflection earlier this year and I never discovered its cause. The error observed was on the order of 20 degrees or more. 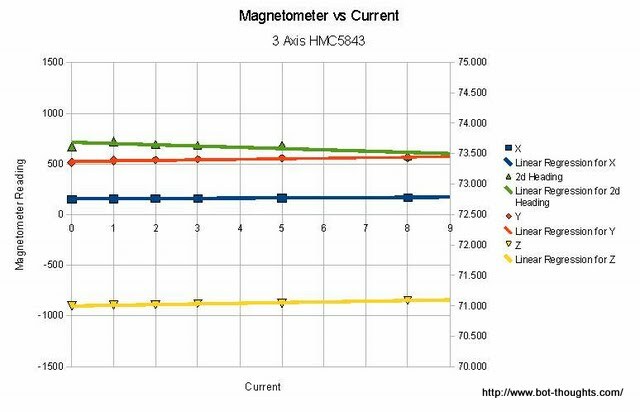 As part of my ongoing work to get ready for the just-announced Sparkfun AVC 2012, I want to see if I can correlate motor current and magnetometer readings using a Honeywell HMC5843 3-axis magnetometer. Test rig for measuring motor current. Starting with the test equipment above, I added an HMC5843 magnetometer, and mounted it and the motor/prop on a wooden board for testing (first picture in the article; HMC is on the red board; LSM303DLH on the green one). The motor and magnetometer were separated by about 5.25 inches. The values from the magnetometer were read by Data Bus' mbed microcontroller and printed over serial. 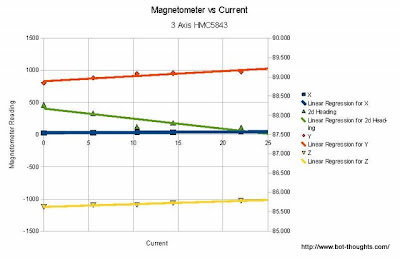 I used a DMM to measure current while capturing X, Y and Z magnetic readings from the sensor for a range of current values. 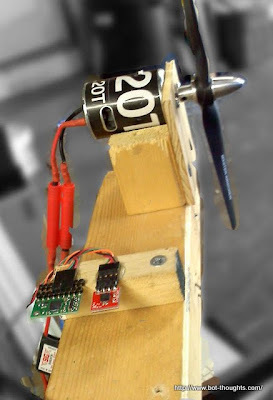 Initially I used a 6V Speed 400, 380 brushed motor with a 7x3 propeller which drew on the order of 9A max. To measure the effects of higher current, I used Data Bus' original 20T, 540 brushed motor with a larger prop and was easily able to draw over 20A of current. Neither motor was equipped with a flux ring. In the first test I used the 1800mAH NiMH battery pictured above, except on the 8A test where I switched to a 2200mAH 2S 25C Gens Ace LiPo. I continued to use that battery for the larger motor tests along with a bigger 30A SIG ESC. The results of the first two tests are in. 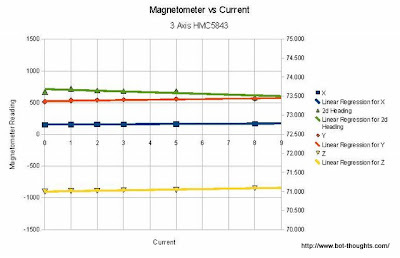 The plot below shows magnetometer effects for the smaller motor with ampere draws in the 0 through 8A range. Effects on 2D heading calculation are shown, too. The 2D heading varied by less than half a degree between the 0A and 8A readings. Below is the plot for the bigger motor and ampere draws from 0 to 22A. Effects on 2D heading calculation are shown again. The 2D heading varied by just over half a degree. 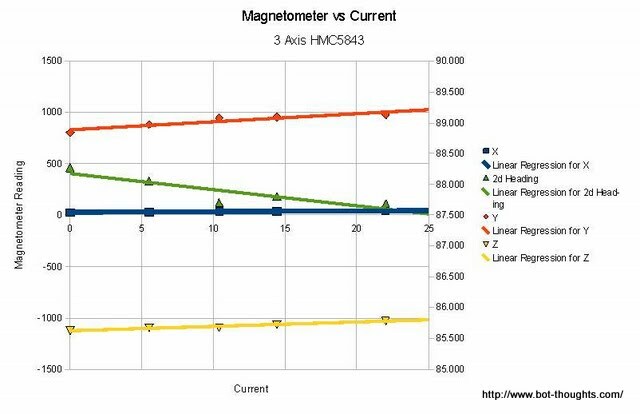 As expected, motor current appears to correlate with changes to magnetometer readings; however, the effect is minimal. The calculated heading suffers only minor error even up to 22A for a 540 size, 20T brushed motor with no shielding (flux ring), and at a distance of only 5.25" between motor and sensor. As magnetic fields diminish with the cube of the distance, even a slight increase in distance should reduce the already minor effects to negligible levels. Hmm, I was concerned about that as well, but half a degree seems pretty minimal. I'll recreate your experiment with the brushless motors I plan to use with the T1 robot in a couple of weeks.